This picture was too funny for me not to post. It doesn't have much to do with my creativity, but illustrates the creativity of a tired, bored toddler after 4 hours in the car. I provided my cute little one with the medium for the creative project (unknowingly) and she went wild (while her parents were not looking). Sofia is just learning about the color wheel and how colors interact with one another. She chose to create a three-dimensional piece demonstrating how not only colors interact, but also how inanimate objects interact with the human physical form. 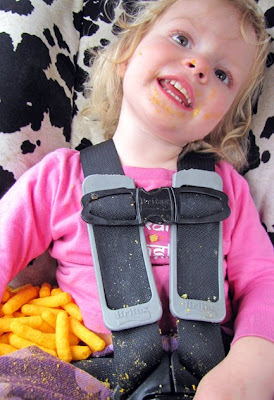 I cannot begin to describe the joy this little one brings to me, even when she dumps an entire bag of cheesy puffs all over herself and the backseat of my car. Sofia looks like she is in a cheezy puffs daze!